Celebrate your East Coast hiking accomplishments with this unique gift and display. This beautifully framed display is printed on to a newly developed and patented magnetic receptive canvas developed by a Colorado company. We all know there are too many to list them all so we did the best that we could. 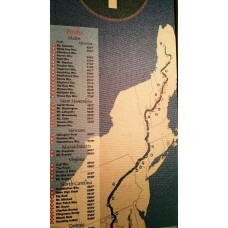 The frame lists 47 peaks and 26 State parks along the trail between Georgia to Maine along the 2185 mile trek. This is a great way to keep track of your progress as you work toward conquering the entire Appalachian Trail. The frame measures 30X10X0.75 and is made from Colorado Blue Pine that has been recycled from beetle kill pine. The Appalachian Trail is a 2,185 mile long public footpath that traverses the scenic, wooded, pastoral, wild, and culturally resonant lands of the Appalachian Mountains. Conceived in 1921, built by private citizens, and completed in 1937, today the trail is managed by the National Park Service, U.S. Forest Service, Appalachian Trail Conservancy, numerous state agencies and thousands of volunteers.